Belated Happy Valentine's Day to you! Sorry to be a day late with my wishes (and love-themed card), but I was sick on the sofa all day yesterday. I have caught my first cold in a long while. Ick. This Valentine card is SO not the usual style I go for. It is very bold, and red is not one of my favorite colors for crafting. I used a new-to-me stamp - the cherub - by Bo Bunny called Enchanted. When I traveled to see my mom in the Houston, Texas area back in the fall, we shopped at Hobby Lobby (LOVE that store!) and this was one of my finds. Very nice card. Love the color combination. I want to thank you for all your appreciation for me. You know when ever i read your kind words i feel sooo HAPPY,i don't know why? but i just wanna tell you that You are so Sweet. 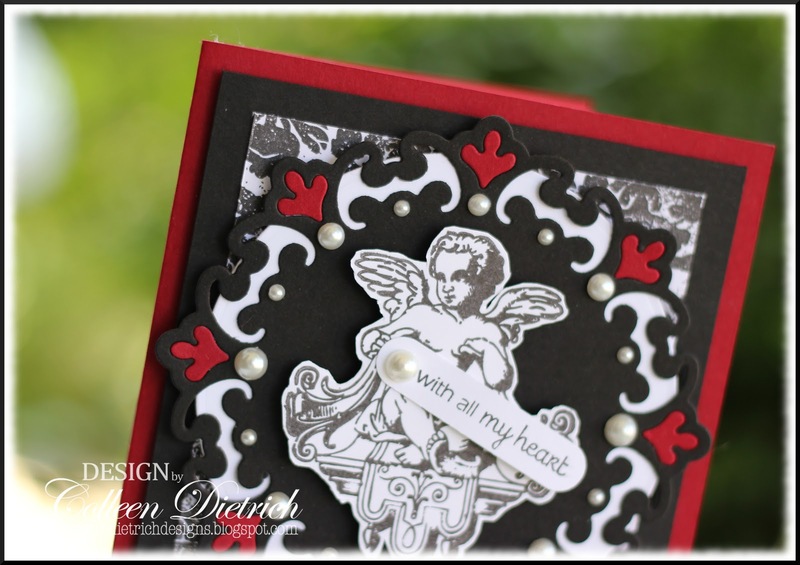 Gorgeous card Colleen, I love the dramatic use of the black, and the fab vintage style image. Wow, what a beautiful card, Colleen! You are right – this is bolder than your normal style, but it is no less striking. :-) I really like that vintage wallpaper background stamp. It looks super on this card! I hope you're feeling better today :-). It was great to chat yesterday! I think the red and black are very classy together! Sorry to hear you "got it"
Hope you feel better soon! I loveeeeeeeee your card! LOVING the colors and love love love those pearls!!! Wonderful card ! I loved the beautiful colors . Your colors are normally soft and muted and I would not have guess you made this. Yet it does have pearls on it. I think it's bold and striking with some drama. Very sophisticated. Oh Colleen this is lovely!! Thanks so much for playing at Papercraft Star! Beautifully done, Colleen. Outside the box is a good thing. I like the red 'thingy's in your die. Wow, what a bold strong card! I love it! I could see it was out of your comfort zone but it so pretty! Love all the details including the Batman sky signals! Yes, they do look like them! Love the touch of pearls too. Great job! Hope you are feeling better. Do you NOT just LOVE HL! When I lived in a Houston suburb I had TWO Hobby Lobby's to choose from! I miss them in Florida! LOVE your bold card and although it's not your usual style, it is FABULOUS and so perfect for Valentine's Day! It may not be your usual colors, but it sure is pretty!!! And I smiled when I read 'Hobby Lobby' my mother has one in her town. It is HUGE! I can literally spend the day in there. You need to craft out of your comfort zone more often!!! This is bold and beautiful!!! Love it girl!!! Hope you are feeling better! I love red, and I don't really see it used that much, maybe because it is a rather bold color. Valentines and Christmas do bring out the red, though. You've used it with your stamp of choice very beautifully here. You have a very elegant style. Wow!!! Colleen - your card is amazing and precious. I love the colors, and how you inserted the red diecut pieces - that's BRILLIANT! Wonderful image, papers and bow too. You rock!! This is o pretty! Love that angel image! Gorgeous card! How fun to know you come to visit Texas!!! Hope you are feeling better soon, and thank you for joining us this week over at the Papercraft Star! Love the bold red on your card! 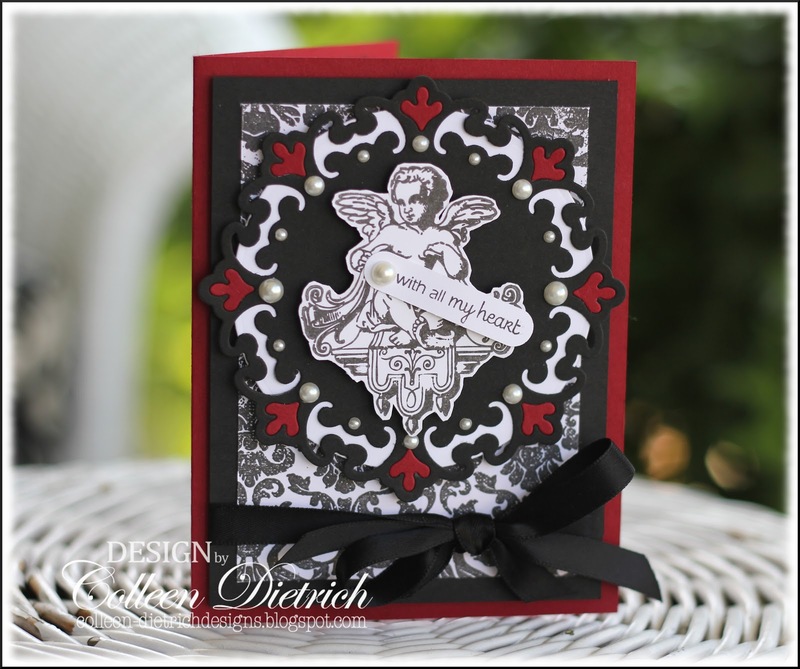 Such a classy color combination with the black and the sweet little cherub :) thanks for playing along with us at Frosted Designs!! Another gorgeous card. I love the sweet little angel you used. Yes, I do love HL - they carry so many great products!! I love your card! Thanks for joining us at Frosted Designs for our Be Bold challenge!